Red Wine Mother of Vinegar, 8 oz. 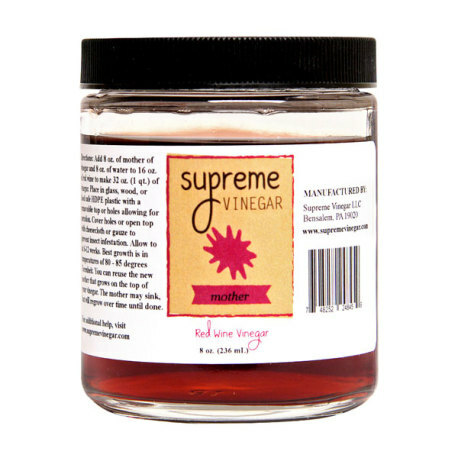 Home › Shop › Other Fermented Beverages › Red Wine Mother of Vinegar, 8 oz. Make your own red wine vinegar! This is an 8 oz. jar of red wine mother of vinegar, a colony of acetobacter bacteria for making vinegar from your own red wine! This 8 oz jar of mother culture can be used to make about 32 oz. (1 quart) of vinegar. Simply add the contents of the jar to 8 oz. of water and 16 oz. of wine. Vinegar production usually takes about 6 to 12 weeks to be complete. After your culture goes to completion, you will not only have vinegar, but a mother than can be reused on new batches of wine for more vinegar production! Make your own red wine vinegar with this mother of vinegar culture!